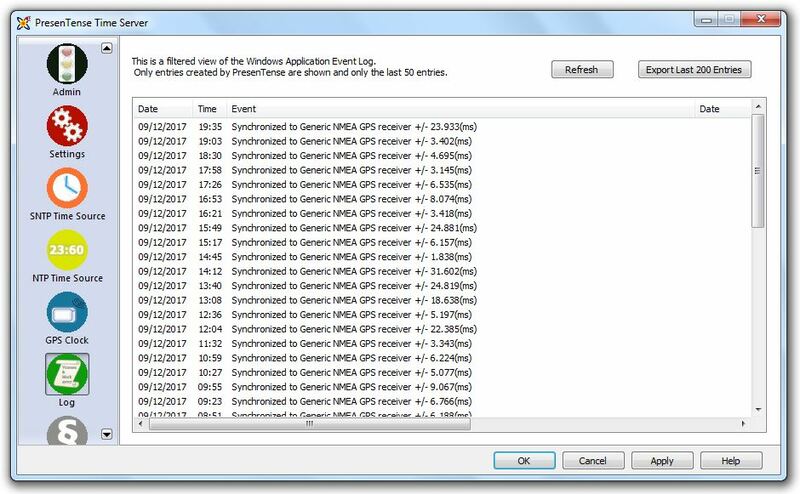 PresenTense Time Server writes to the Windows Application Event Log. The Log tab filters the view of the Application Event Log so that only entries from PresenTense Time Server are shown. Logging must be enabled on the Settings tab in order for any entries to be inserted. The log tab entries are refreshed from the operating system event log whenever you switch to the log tab from any of the other tab or when the Refresh button is clicked. The view updates itself periodically but you can click Refresh to force an update. When you are experiencing problems with PresenTense Time Server, please set logging to Detailed on the Settings tab and then click the Export Last 200 Entries button. A file called AEL-Export.txt can then be found in the directory where PresenTense Time Server is installed. This file can then be sent to the support section of the company from which you purchased PresenTense Time Server. If you purchased PresenTense Time Server from Bytefusion, please email this file, along with a description of your problem and your license number or a copy of your invoice to support@bytefusion.com.